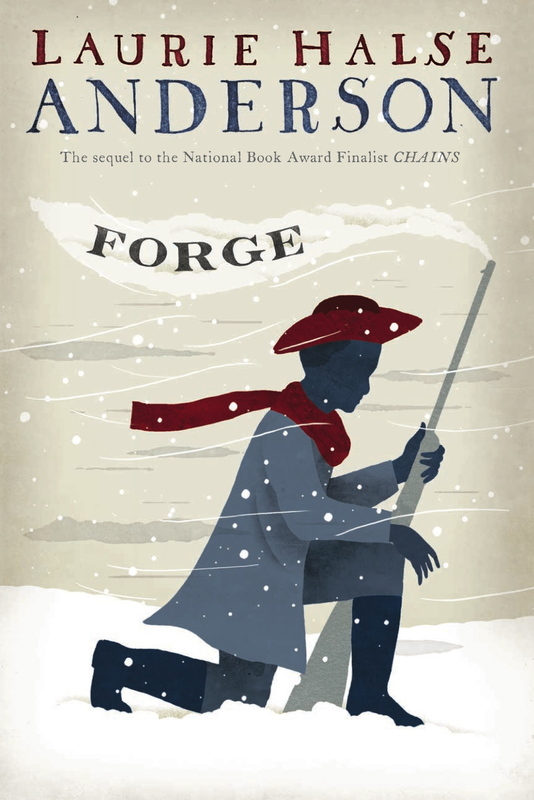 Fifteen-year-old Curzon Smith, freed slave and former traveling companion of the stubborn Miss Isabel Finch, gets himself in quite a fix when he saves the life of a Patriot boy soldier during the fall of 1777. The result of that one selfless act causes him to become a member of the 16th Massachusetts regiment of the Continental Army on the eve of what is to be one of the most grueling experiences of the Revolutionary War: Valley Forge. But what his stalwart companions don’t know is that the terms of Curzon’s freedom aren’t as cut and dried as they seem. And when his former master turns up at Valley Forge, Curzon will need his lost angel Isabel to give him the courage to take back his freedom and once again make it his own. (If I sound a bit cagey, I don’t want to give too much away, as this wonderfully twisty-turny tale is full of juicy surprises of both the good and bad variety.) This stand-alone sequel to Chains can be read either before or after Isabel’s story, but I strongly suggest reading both. Teen peeps, let me be clear: I really like Chains. But I LOVE Forge. I don’t know if it’s Curzon’s perfectly executed teen voice, or Anderson’s easy prose that makes the history go down like buttah, or a magical combination of both, but Curzon has my heart as much as Isabel has his. Thanks for your good review of Forge. I loved Chains–we have used Chains as a supplemental read to Draper’s Copper Sun. Now, cannot wait for Forge! I cannot wait to read Forge. I loved Chains and have introduced it to several faculty at my school who have ended up using it as a classroom read. I am so eager to begin reading Forge! The realistc characters and entertaining plot of Chains keeps it on my list as a favorite historical fiction. Now I have a new reason to look forward to October! Excited to read this follow up! Love the cover design! I was totally clueless about Laurie Halse Anderson & am now very curious. Might I finally get into a book BEFORE it disappears from the public’s radar? Hahaha! BTW, my Squidoo page is NOT about an American historical novel, so it may not be for this blog’s readers. But if you’re curious about life in Medieval Japan, Shogun, Kabuki theater, and the real-life “Sherlock Holmes of Japan,” please visit. Man, I totally agree about Forge being better than Chains and I loved Chains! I just kept pushing it and pushing it and now doing the same with Forge. Ashes can’t come soon enough. I’m buying Forge tomorrow and I can’t wait. I finished Chains like 2days ago and I’m even more psyched about when the third book, Ashes, will come out! Chains was awesome! thank the Lord I have pateince enough to wait for Forge! I LOVed Chains and I’m hoping I can check forge out at the public libary. I’m prettty sure the follow up book after forge will be even better than Chains and Forge combined.